These herb infused potatoes may be served with a vitello tonnato or our Chicken Teriyaki – or simply with a fresh salad. 1 tsp coarse salt Wash and cut potatoes in half. Place potatoes and salt in large casserole filled with water. Cook on medium heat approximately 25 minutes. Test potatoes with point of sharp knife – potatoes should be cooked yet remain firm. Potatoes may also be cooked in pressure cooker for 12 minutes. Drain and set aside. Bake in 190 C oven for 1 hour and 30 minutes – turning potatoes during baking time to brown evenly. 20 fresh bay leaves Wash thyme and bay leaves – set aside. Baking time: 1 hr 30 minutes 15 minutes prior to end of baking time and once potatoes are golden, sprinkle garlic, thyme and bay leaves. Toss together. Return to oven and finish baking. Just before serving, strip the leaves from the sprigs of thyme. 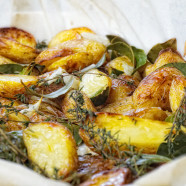 Discard the sprig or branch of thyme and sprinkle the potatoes with the leaves.